It’s Oceans of fun as you go under the sea with your friends from SpongeBob Squarepants the guy that everyone loves. Make your childs day special with a castle that is pure artistry. Bright and vibrant colorful scenes painted throughout. Your guests can jump just like they would if they were under the sea catching jellyfish with Spongebob Squarepants and Patrick Star. Not just a panel Spongebob Squarepants Clubhouse is a full front unit. We give you more for less. 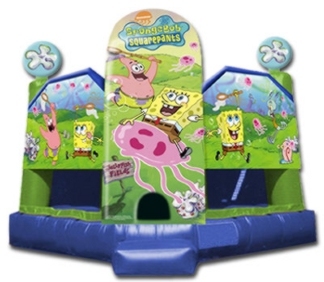 JumpMaxx prides ourselves in providing America with newer, cleaner, high end entertainment with inflatables like the Spongebob Squarepants Clubhouse and many others.